September 2017 – He Said What?! Last night I was helping Aaron turn down his covers as he got ready for bed. Sometimes there is a moment that is especially poignant with Aaron. A moment that hits me in a profound way…..in a way that causes me to remember where we were and what we were doing when the moment occurred. The night before, Aaron….for whatever reason…..was very groggy and dizzy, with slurred speech and unsteady legs. He was still trying to talk, but with great effort. Last night, though, Aaron was his usual chipper self. We were going through his bedtime routine as he talked and talked and talked. He brushed his teeth, swished his mouthwash, helped me set up our diffuser – which means he poured in the water, checked the name of the oil, and took a little tentative sniff – watched as I turned on the baby monitor we use to listen for seizures, made sure I picked out his clothes for the next day and that they were on the back of his desk chair, put his back scratcher and hand towel on the seat of his chair, blinds lowered, desk clock turned around so the light doesn’t bother him, glasses put just where they belong, wrist watch put right beside his glasses, shoes in front of the closet, stuffed animals precisely in place in his bed, covers pulled up, and animal print blanket put on top of the bed exactly right and with no wrinkles. It’s a process…..done precisely….or we must re-do the process until precision is reached. Shauna is one of his friends at his day group, Paradigm. “She’s getting a NEW wheelchair!” Aaron answered. Aaron had no idea of the impact of his simple answer to my question, and of the many thoughts that cascaded through my mind in a split second. He just kept talking. “I told her she should get a PINK one! !” he exclaimed, and then laughed at the thought of a pink wheelchair. We smoothed his animal print blanket then. He was finished with pink wheelchairs and had moved on to his bedtime log book…..his notebook in which he writes down the exact time he gets in bed and the exact time the next morning that he gets out of bed. That’s the time he wrote. So was it 10:22 when Aaron spoke of Shauna’s wheelchair? Or 10:21? That fact would be important to Aaron. But all I knew, after our goodnight hug and after I had turned out his light, is that my 33 year old son was happy about his friend’s new wheelchair. That was nice of him. But…..
Aaron wasn’t talking about his friend’s new car. Or new job. Or new house. He was talking with pleasure about her new wheelchair……because his friends have special needs, like he does…..and a new wheelchair is indeed a big deal. But as Aaron’s mother, this comment from him somehow yanked open that little door in my heart that I try to keep closed. I try to keep it closed because I don’t want to hurt for him or for his friends. I want to see his life as a wonderful thing, and it truly is! But the reality of his life…..and the lives of his day group friends…..is far different from your typical 33 year old young man. Most young men Aaron’s age would be talking about new cars. Aaron was talking about new wheelchairs. I’m so happy that he was happy for Shauna. But my momma heart got a deeper little crack in it last night. I haven’t been writing lately. I’ve just been very burdened about lots of issues. Life goes in cycles like that, you know. As a Christ follower, I know to be careful during those down seasons. It’s very easy to be consumed with the here and now, and with all my own worries…..not to mention the serious concerns for some in my family and some of my friends…..and even our great country. So I’ve asked God to do what I have often in the past asked Him to do, and that is to give me some extra special assurance from His Word. And God did just that a few days ago. He gave me a sweet message from His Word, ABOUT His Word. It’s from Isaiah 8. Israel was facing dark times, and so God told them lots of truths about how they were to behave, how they were to act, Whom they were to obey and to fear, and even warned them about seeking answers from mediums and fortune tellers. Where do I need to go when I’m overwhelmed with burdens…..with darkness…..with struggles…..? Where do I go when the reality of Aaron’s life makes my heart sad? To a book? To a person? To an activity? To food? To entertainment? To the teaching! To the testimony! In other words, to God’s Word. Staying in my Bible. Reading it with purpose, asking God to open His Word to me and give me direction….this is where I need to go. Wades through the affairs of life……the unexplainable, the sad, the hard, the heavy. I must wade through it all with my finger on God’s Word. No other substitute will give me the peace and the comfort that I will find as I read what God says to me in His Word. I can’t tell you why Aaron has special needs. I won’t say it doesn’t hurt, sometimes more than others. But let me tell you about God. Let me tell you about His love. Let me tell you that He is sovereign. Let me tell you what He has written. What a beautiful sight any time of day, but to me a special morning blessing! It only got better a short time later when I went outside and saw a faint second rainbow in the sky. Before long, the lightning got brighter and the thunder was louder. Then came the rain. And after the rain, our rainbows reappeared. The same scenario repeated itself as soon more rain fell. I was up and down, inside and outside, and enjoying the rain with Gary as we watched from inside the garage. Some of the lightning was close and scary. Some of the thunder was loud and unsettling. But we were safe. And we were thankful for the rain, which brings growth and nourishment to our yard and gardens. The rainbow that I first saw reminded me of the fact that it’s vital for me to have a grasp of God’s promises before the storms hit. It’s so important for me to have that knowledge of what God has to say to me, found in the Bible, tucked into my brain and my heart. I need to be reading His Word, remembering His promises, and learning WHO God is…..and doing this every day. Days add up to weeks, then months, then years. Looking into His Word, listening to God, talking to Him……just like looking up every morning and seeing a beautiful rainbow that catches my eye and grabs my attention. That’s what I need to be doing with God’s Word. Then one day…..BAM!!! The storm hits, in whatever form that takes, and even though the beauty of the rainbow may be hidden by clouds, I can still trust that it’s there. I can still trust that God is there, with His promises that are highlighted in my Bible and hidden in my heart. I don’t need to be afraid, distressing and exhausting though my situation may be. That’s because I’ve gotten to know God intimately over those days and weeks and months and years. Not it’s time to put into practice what I’ve put away. It’s not the power of positive thinking. It’s the power of God’s promises…..of God Himself!! He will give me comfort and safety in the storms. He will be my place of safety in my distress. Sun, moon, and stars in their courses above. All I have needed, Thy hand hath provided. At the end of the day, I can see God’s hand all over my life. This morning did not go as I had planned. Maybe it’s because I feel so tired. I haven’t slept well for several nights and don’t know why. We all do that at times. And you know how those long nights are, when every little issue in life is magnified. Nothing is horribly wrong, but even my to-do list seems overwhelming at one in the morning! But all of this is an excuse, really, and I know it. I love how Gary stops to enjoy the world around him. Sometimes I may not quite agree with it, like when he found a huge Orb Weaving Spider on the back of our patio chair recently and instead of killing it, he placed it gingerly in our flower bed. You who know my fear of spiders will also know that I am now avoiding that flower bed, or am stalking around it carefully like an NCIS agent at a crime scene. I wasn’t at all surprised this past Sunday afternoon to walk out in our garage and find a Cicada, a poor dead Cicada, laying on Gary’s work bench. I knew that Gary had placed it there for me and for Aaron to see. I didn’t even have to ask. I paused to look at it, which prompted Gary to tell me about the Praying Mantis he had rescued from the ground and placed in the pecan tree. And then Gary remembered that he had meant to get his magnifying glass so that Aaron could have a closer look at the Cicada. I got Aaron while Gary got the glass, and soon Aaron was doing his own examination of the Cicada. Everything about this common creature…..this sometimes annoying insect…..was super fascinating when enlarged under the magnifying glass. His sheer, intricate wings……his compound, bulging eyes……his very perfect camouflage design…..the hooks on the end of his legs. As Aaron examined the Cicada, we took the opportunity to point out that all of this design was God’s doing. Aaron knows that. But still it’s nice to have the opportunity to again draw Aaron’s attention to the reality that we have a personal Creator Who put lots of thought and planning into the design of an insect. Our Cicada encounter has made me pause, once again, to also examine another fact that I know all too well but sometimes struggle to remember. Our own Aaron, unique and special, is also one of God’s extraordinary designs. Why would I struggle to remember that fact? Because just as the shrill noise of a Cicada can be irritating, sometimes the daily-ness of Aaron’s behaviors can be irritating as well to me and Gary. Yet when we stop to examine his intricacies, we do see how amazingly Aaron is wired. Aaron came out on the patio…..yet again…..and interrupted our conversation by asking if he could have his three water bottles. I told him that he should just drink one, considering that it was a little late and he had drunk a big glass of water at dinner. He would not drink just one of his three water bottles, because the three must always go together as three. You do NOT drink ONE of the THREE. You drink THREE of the THREE. However, he said that he would drink one bottle of water from the frig in the garage where we keep the water bottles. That’s because the water bottles in the garage are not part of the THREE. Getting Aaron to veer from this set way of thinking is like treading water…..in the middle of the ocean…..with no rescue ship in sight. Trust me. So as Aaron and I talked about this water bottle decision, I was internally examining him and realizing fairly quickly where he was coming from. So amazing he is! We got him the old Star Trek television series from the 60’s as a Christmas gift. He has been watching them in his bedroom, at his desk, on his computer monitor. But then he started coming down to the family room to watch any other video that he wanted to see instead of using his own DVD player in his room. Why, you ask? Well, at least we asked. And though Aaron didn’t exactly verbalize his reasoning at first, we soon realized that for now, his DVD player is only for Star Trek…..since it IS a series and since he DID already start that series on his player in his room. He MUST finish the series on his DVD player before watching anything else, even if it takes months. Gary and I can go along with it, or we can fight it and suffer the unpleasant consequences. It didn’t take Gary and I long to decide how to handle that one. Welcome to the family room, Aaron. Yesterday Aaron had a doctor appointment, which always means that I take him to lunch. Eating out is his favorite sport! Yes, sport…..because sometimes I feel that I have run a marathon after running interference during the course of our meal. Or maybe that’s football. Anyway, yesterday during our lunch Aaron heard the couple in the booth behind us order Espinaca. He asked me what that was, so I explained it to him. He still wasn’t quite sure about it, so when the unsuspecting couple’s Espinaca was brought to their table, Aaron wanted a look. Before I could say “Espinaca,” Aaron was up out of our booth and halfway to their booth….craning his neck to catch a glimpse of their mysterious dip. I do hope they were understanding. I didn’t ask. This whole incident led to me showing Aaron pictures of Espinaca…..going to Wal-Mart to buy ingredients for Espinaca….putting Espinaca ingredients in the crock pot…..and eating Espinaca while we watched a video last night….in the family room. Yesterday evening, Gary and I were in the garden for a few minutes. Then we sat on the new bench Gary got us, under our old oak tree. It was so pretty outside, and so nice to sit together for a few minutes. But then the back door opened and out walked Aaron. Gary sighed, and I knew what he was thinking. Our quiet time was about to end. “But look at him, Gary,” I said. “Just look at him.” And we both looked at Aaron lumbering across the grass, wearing his pajama sports shorts and sleeveless shirt, with his socks and tennis shoes. And we both just smiled at the sight of him. Yes, we knew what was coming and we were right. Godzilla this and Godzilla that, because Aaron just discovered that there will be ANOTHER Godzilla movie in 2018!!!! And there we sat, we three, scrunched together on the bench…..listening to Godzilla talk. But Gary and I were smiling, and we were responding, because this is the family that God has made us to be. You know, I don’t have a magnifying glass big enough to examine Aaron all at once. But each little piece of him is very fascinating all alone. Put together, he is one very complicated…..very astounding….very funny….work of art. I was walking through our vegetable garden one day in early summer, looking at the pretty little plants growing so nicely where Gary and I had placed them. There was the summer squash on the front row, along with some zucchini. The tomatoes were already inside their tomato cages that Gary had put up, and behind them were our okra plants. Cucumbers were on the side of the garden near the tall oak tree. We have a simple garden this year, not as full as it sometimes is, but enough for us and hopefully some to share with others. Everything was where it should be, growing as we had hoped at this point, with no visible bugs or other problems that I could see. Weeds hadn’t started taking over yet, either, so I felt content as I turned to leave the garden. But wait. What was this? I stopped between the tomatoes and okra as I noticed a plant growing in a place where we had not put a seedling. It wasn’t a weed. It looked for all the world like……a cucumber? But what would a cucumber be doing here, when the rest of the cucumbers were all the way over on the other side of the garden? I hadn’t planted it there. Gary hadn’t planted it there. Hmmmmm……. I stood looking at it, wondering what to do. There are any number of ways that a cucumber seed from last year ended up under the soil and then growing again this year. I’ll never know for sure. But what I did know was that I would not have planted that cucumber in the spot where I found it. It was too near the edge of the garden, for one thing. It might get all tangled up in the okra or try to climb the tomato cages. It might want to grow out into the yard where Gary mows. It might not flourish under the sunflowers that were soon to be planted right there where its leaves had sprouted. Bottom line……that volunteer cucumber was just not at all where I would have put it. I didn’t want it there. I could think of all the reasons mentioned above that I didn’t want it growing where it had sprouted. It hadn’t been in our garden plan at all. Now here it was, intruding in a place and at a time that I hadn’t intended for it to be. I hated to uproot a growing vegetable plant, however. And with that, I turned and walked out of the garden……my garden that now held a stray cucumber plant. A plant that messed up my plan. One that, honestly, I didn’t want. I watched that vagabond cucumber plant over the next days…..days that became weeks. I left it where it was, more curious as time went on to see how it would fare. And guess what? My stray cucumber plant grew beautifully! In fact, it grew better than the other cucumbers that I had so carefully planned and planted on the other side of the garden. It wasn’t long before I saw the first tiny little spiny cucumbers growing under its leaves. I tended it carefully, pulling its curly tendrils away from the tomato cages…..guiding the growing vine out of the yard and back to the garden…..watching another of its vines growing up a tall sunflower stalk. The fruit of that unwelcome cucumber has been beautiful and sweet. We’ve benefited from it very much, and so have others with whom I’ve shared. I’m so thankful that I didn’t follow my first response and pull the cucumber from the soil! I’m thankful that I stepped back, gave it time, let it grow, and then enjoyed the sweet fruit…..and the lessons it has taught me. One thing we all know, if we live long enough, is that life is full of surprises. We can be going along just fine, things working out the way we had planned, when BAM!! We hit the proverbial wall. Suddenly, things are NOT going as planned. Now what? As followers of Christ, we’re certainly not exempt from those detours in life. In fact, God does put situations and events and people into our lives for a purpose that sometimes only He knows. Maybe He’ll share it with us and maybe He won’t. So again, what do we do? Do we try to fix it? Get rid of it? Ignore it? And if we can’t do any of those, do we argue with God? Get angry? Get bitter? I mean, admit it, there are things that happen to us that that we just can’t see any reason for. Really, God? I would NOT have done that. I would NOT have put that situation in that place in my life at all. I mean, maybe another time…..another place…..or better yet, not at all!! So, God, this wasn’t in my plan. I had my life pretty well mapped out, you know. Grow up….college….job….husband….kids…..family….. I didn’t plan on Aaron falling back into my arms that Sunday afternoon 25 years ago, seizing and bleeding and unconscious. That was most unwelcome. I didn’t plan on being given his further diagnosis of autism 7 years after that. I mean, isn’t Epilepsy enough? I didn’t plan on still being his caregiver when he’s almost 33 years old. Don’t You know about empty nest? How welcome, on many days, THAT would be? So…..this plant that You have placed in my life? Why did You put it there? I might agree to it in some form…..over there, in another area, to a different degree. Here….just let me decide where it goes and how big it grows, OK? Really, I would never have put it there in the first place…..in case You want to know. But oh my goodness, what God has taught me over the years from that little unwanted seedling that popped up where I didn’t plan it! There you have it. Eight little words that speak incredible volumes about God and His sovereignty. It doesn’t say that His way is easy…..fun…..pretty…..popular…..understandable. Or fast. Gary and I are in this life with Aaron for the long haul. We each have our own situations that God has put, just so, in our lives. As we stand and look at whatever that is, we must choose whether to accept God’s placement in our garden or to spend our life hating it. But let me tell you, when you accept that God’s way is perfect and you let Him be that Master Gardener in your life, you’re going to one day see fruit. You’re going to see growth in your life that you never thought possible. You’re going to see beautiful fruit like peace, joy, thankfulness, wisdom. And best of all, that fruit is what you’ll be able to share with others…..especially others who are suffering. Comforting as you have been comforted…..blessing as you have been blessed. God does know what He’s doing, after all. His way IS perfect, and perfectly placed, in each of our lives. Considering suffering to be joyful is not a trait that comes naturally. How do we do that, anyway? Weeks ago, we had a strong storm during the night. It was a Kansas storm, full of bright lightning, loud thunder, and very strong winds. 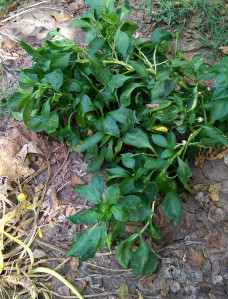 When I was able to get out in the garden several days later, I was disappointed to find that my only pepper plant that had done any decent growing was now toppled over. I stood there staring down at it as it lay on the nearby zucchini, whose leaves had also been tossed around during the same storm. I stood there, tempted to just uproot the battered pepper plant and be done with it. I bent over and gently lifted it, realizing then that the main stem of the pepper plant was unbroken and was still safely in the soil. “Why not just leave it and see what it does?” I thought. And that’s what I did.